"The power of God was wonderfully displayed; scores of sinners fell under the preaching, like men slain in mighty battle; Christians shouted aloud for joy.". "I have seen more than a hundred sinners fall like dead men under one powerful sermon, and I have seen and heard more than five hundred Christians all shouting aloud the high praises of God at once; and I will venture to assert that many happy thousands were awakened and converted to God at these camp meetings. Some sinners mocked, some of the old dry professors opposed, some of the old starched Presbyterian preachers preached against these exercises, but still the work went on and spread almost in every direction, gathering additional force, until our country seemed all coming home to God". "Just in the midst of our controversies on the subject of the powerful exercises among the people under preaching, a new exercise broke out among us, called the jerks, which was overwhelming in its effects upon the bodies and minds of the people. No matter whether they were saints or sinners, they would be taken under a warm song or sermon and seized with a convulsive jerking all over, which they could not by any possibility avoid, and the more they resisted, the more they jerked. If they would not strive against it and pray in good earnest, the jerking would usually abate. I have seen more than five hundred persons jerking at one time in my large congregations. Most usually, persons taken with the jerks, to obtain relief, as they said, would rise up and dance. Some would run, but could not get away. Some would resist; on such the jerks were generally very severe. "To see those proud young gentlemen and young ladies, dressed in their silks, jewelry, and prunella, from top to toe, take the jerks, would often excite my risibilities. The first jerk or so, you would see their fine bonnets, caps, and combs fly; and so sudden would be the jerking of the head that their long loose hair would crack almost as loud as a wagoner's whip". "I always looked upon the jerks as a judgment sent from God, first, to bring sinners to repentance; and, secondly, to show professors that God would work with or without means, and that he could work over and above means, and do whatsoever seemeth to him good, to the glory of his grace and the salvation of the world. "There is no doubt in my mind that with weak-minded, ignorant, and superstitious persons, there was a great deal of sympathetic feeling with many that claimed to be under the influence of this jerking exercise [i.e. mere human emotion]; and yet, with many, it was perfectly involuntary. It was, on all occasions, my practice to recommend fervent prayer as a remedy, and it almost universally proved an effective antidote". "There were many other strange and wild exercises into which the subjects of this revival fell; such, for instance, as what was called the running, jumping, barking exercise. The Methodist preachers generally preached against this extravagant wildness. I did it uniformly in my little ministrations, and sometimes gave great offense; but I feared no consequences when I felt my awful responsibilities to God". Cartwright recounts another camp meeting in 1809: "At the close of the meeting we had many seekers who had not obtained comfort. Twelve of them got into a two-horse wagon, and myself with them. We had to go about fifteen miles, but before we reached our home every one of them got powerfully converted, and we sung and shouted aloud along the road, to the very great astonishment of those who lived along the way". In 1812 a slave owner, Sister S. was struggling in agony for a clean heart. Cartwright recounts: "She then and there covenanted with the Lord, if he would give her the blessing, she would give up her slaves and set them free. She said this covenant had hardly been made one moment, when God filled her soul with such an overwhelming sense of Divine love, that she did not really know whether she was in or out of the body. She rose from her knees, and proclaimed to listening hundreds that she had obtained the blessing.... She went through the vast crowd with holy shouts of joy, and exhorting all to taste and see that the Lord was gracious, and such a power attended her words that hundreds fell to the ground, and scores of souls were happily born into the kingdom of God that afternoon and during the night". 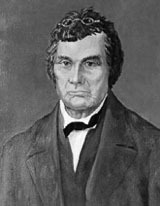 Peter Cartwright was a Methodist circuit rider. The following excerpts describing the events of the Cane Ridge Revival are taken from Autobiography of Peter Cartwright (Nashville: Abingdon Press, 1984).